Can't attend? Follow The Mammoth Collaborative to know of future events! The St James Fitness Festival, a brand new fitness and music festival, amps up Singapore’s robust festival scene with its debut on Saturday, 5 November at St James Power Station. Taking its cues from trendy live events from around the world which marry music and wellness, the festival celebrates the active mind, body and soul through live music acts, exercise classes and even glow-in-the-dark games! The St James Fitness Festival, promises a premium fitness experience for everyone, regardless of age or capability, including popular workouts such as Zumba and HITT, as well as unique music-driven fitness activities like Dance Yoga, Bollywood Yoga and U-Jam Fitness. Fans of dance fitness group workouts can participate in high-energy Zumba classes led by popular local instructors Sock Ling, Rachel Tan and Heidi Lim, as well as an adrenaline-pumping U-Jam Fitness® session led by Sacramento-based trainer Kristen Noel (aka K-Swag). 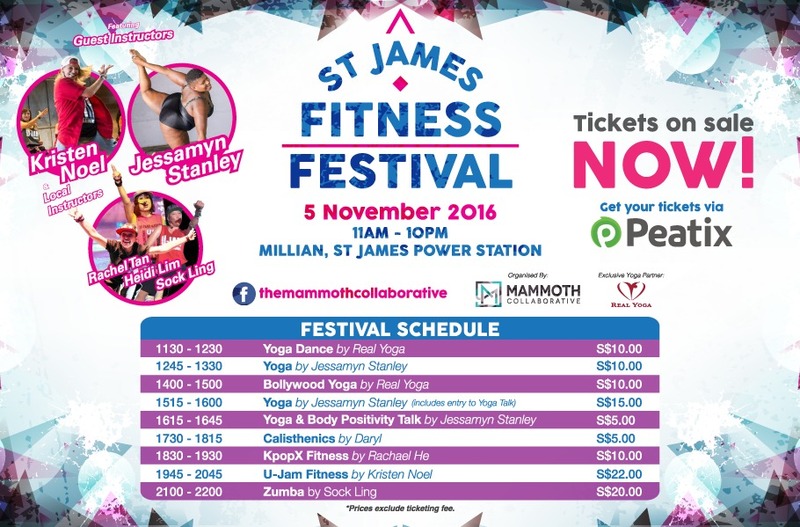 Organised by The Mammoth Collaborative, The St James Fitness Festival will also play host to Jessamyn Stanley – the self-described “fat femme” yoga teacher and body positivity advocate whose eponymous yoga lifestyle on various social platforms attracts thousands of followers each day. Join Jessamyn at the festival as she uses high energy vinyasa flow as a way to move past mental and emotional barriers encouraging you to ask “How Do I Feel?” rather than “How Do I Look?”.